Which is why The Red Rattler Theatre turned down a request by a Hilel, a Jewish NPO, to hire the theatre to put on a series of shows about the Holocaust. Because, the Holocaust happened to the Jews. And the Jews are the exception to the rules of inclusion. There’s a tie-in here. A causal link is drawn between the Holocaust, Jews, and Israel on the one side; and the oppression and occupation of “Palestinians” on the other. Once that link is drawn, it becomes acceptable for “decent people” to exclude the Jews from a general policy of inclusion. It’s okay to dismiss the Holocaust, the systematic gassing of 6 million people of a specific ethnicity. Because Jews are the reason for Israel and Israel is the reason for “Palestinian” misery. In other words, once you see the link between all of these things: Holocaust, Jews, Israel, and Occupation, the Jewish people become the exception to the rule. Jews no longer count as a people. Their narrative doesn’t count because it contradicts the narrative that is beloved by the people behind The Red Rattler Theatre initiative. And if the narrative of the Jews contradicts the narrative of the Red Rattler Theatre people, by extension, the history of the Jews as the indigenous people of Israel doesn’t count. Archaeological artifacts proving the indigenous nature of the Jewish people also don’t count. The Balfour Declaration and the San Remo Conference? They too, don’t count. Because they contradict the narrative that The Red Rattler Theatre people choose to accept, in spite of history, archaeological artifacts, and international law. Despite the fact of a competing narrative. One way of testing our performances can be to ask ourselves – if the room is all persons of that ethnicity, am I confident that my show is not racist? For many long years, the mantra of the anti-Israel crowd was that criticism of Israel does not presume anti-Semitism. That led to the assertion of a certain ideology with its false narrative of colonization and occupation regarding a place called “Palestine.” By insisting that anti-Israel attitudes were separate from personal feelings of antipathy toward an ethnicity, namely the Jews, the Israel haters managed to cloak this narrative, however devoid of facts and history, in a veneer of respectability. This allowed the haters to trumpet their hate far and wide, without limits. And it made that hatred acceptable. With hatred of Israel now mainstream, there is no longer any need to continue the farce that hating Israel has nothing to do with hating Jews. The pace of anti-Semitism is picking up on a daily basis all over the world. It has become possible and even de rigueur to express outright hatred for one specific ethnicity, the Jews. And now that it is acceptable to hate the Jews, we don’t have to listen to their tales of eternal woe. Shows about the Holocaust can now be blocked, because the Holocaust was the reason Europe funded Israel’s “colonialist” aspirations, says this (false) narrative. If it hadn’t had been for the Holocaust, Europe would not have felt guilty and would not have paid out the nose to create the Jewish State. “Palestinians” would not be oppressed if it weren’t for all that Jewish history and the ensuing guilt. The history of the Jews in Israel predates the Arab people, predates Islam. And forget any notion of a wartime population exchange. So what if 850,000 Jews were expelled from Arab lands when Israel was declared a Jewish State? So what if Israel took in its Jewish brethren while the Arabs who left pre-state Israel in 1947 were kept as perpetual refugees in an act of collusion by all 22 Arab states? The Holocaust has nothing to do with “Palestinian oppression.” It has nothing to do with the fact that the Jewish people are the indigenous people of Israel. On the other hand, the Holocaust has everything to do with the hatred of a single people, a single ethnicity, the Jews, and that’s the truth. As the truth flies in the face of the notions of The Red Rattler Theatre crowd, however, the only thing to do is to close the eyes, to block out the notion of the Holocaust in particular, since it lends credence to the idea of Jew as victim. The only thing to do is exclude, exclude, exclude. Exclude the Jews. Exclude the Holocaust. Exclude all other narratives and the facts that support them. The policy of The Red Rattler Theatre is exclusion. The policy of the Red Rattler Theatre is hatred. The policy of The Red Rattler Theatre is to close its eyes to a competing, fact-based narrative. 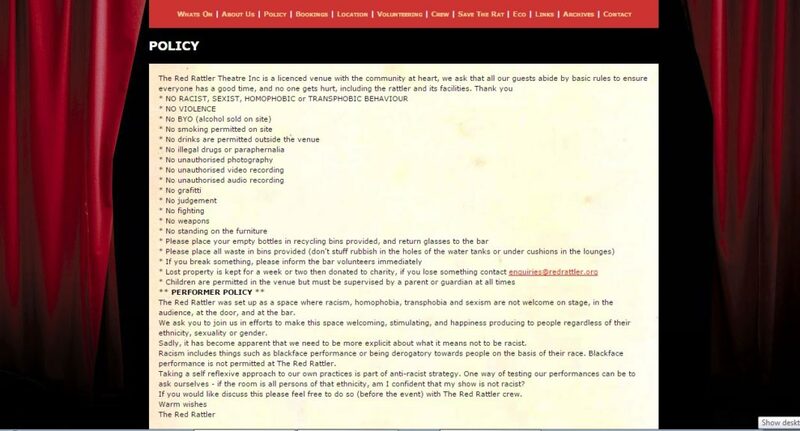 The policy of The Red Rattler Theatre is to single out a solitary ethnicity as the focus of its overweening hatred.